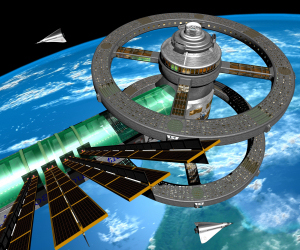 Will “space arks” in orbit have both artificial gravity AND decent Internet access? Has Samsung invented a truly unbreakable smartphone screen? Will Facebook's new “downvote” system eliminate fake news, or just make it easier to fight with your friends? And is there a solution to the “over/under” toilet paper problem? This issue is guaranteed to make you 146% smarter -- you'll see why. Read, think, and, comment! How old do you need to be to have your own YouTube channel? Apparently the bar for that is pretty low. A six-year-old boy named Ryan has racked up over TWENTY BILLION views in the past three years with his toy reviews. With ad revenues topping $10 million annually, the youngster is now starting his own line of toys. Tech product reviewers are swooning over the new Lenovo smart display with Google Assistant. The basic idea, The Verge says, is “take a Google Home smart speaker and put a screen on it, just like Amazon’s Echo Show.” Oh, and add a $250 price tag. Could this finally be the year of the unbreakable smartphone screen? Maybe, if you demonstrate it using a rubber mallet as Samsung does in this video. Bowing to bad taste, YouTube’s video player now automatically adjusts aspect ratio to accommodate vertical videos. Next problem for Google to solve: automatic adjustment of toilet paper dispensers to solve the over/under problem once and for all. “Smartarms,” a simple and inexpensive prosthetic arm developed by a pair of Canadian students, took home top prize in Microsoft’s annual Imagine Cup competition. Let’s give them a hand! Google tested its Titan Key physical security dongle on its own 85,000 employees and says that none of them got hacked in 2017. Now it’s coming to the general public to tighten up online security. Google has dramatically enhanced Search’s presentation of events such as concerts and art festivals with detailed overviews, ticketing, and other useful features. LinkedIn is very proud to announce the debut of voice messaging, which allows multi-level marketers to annoy members in SurroundSound instead of mere text. The best smart locks that support Amazon Alexa include the August Smart Lock (3rd Generation), Schlage Camelot Touchscreen Deadbolt, Yale Assure Lock, Kwikset SmartCode Deadbolt, and Kevo Convert, according to Android Central. Google Assistant can now do things automatically at scheduled times, which is kind of scary when you think about it. Facebook is rolling out a “downvote” system similar to Reddit’s in an effort to fight trolls and fake news. Enough users clicking the thumbs-down icon can push unsavory posts down the News Feed into oblivion. Tired of Charter Communications’ shenanigans to evade, ignore, and outright lie about compliance with its statewide franchise agreement, the State of New York has ordered the company to divest itself of Time-Warner Cable in NY or pack up and go home. Doctors love virtual assistants but they are not HIPAA compliant, warn medical IT experts, which can create large liabilities for physicians and hospitals. Most recent comments on "Geekly Update - 29 July 2018"
Toilet Paper Over/Under? If you have cats, under. That way kitty can't spin the roll and dump it all on the floor. Otherwise, over. Problem solved, no Google assistance needed! I totally agree with Ken Mitchell about the orientation of the toilet paper. In addition, I see another very compelling reason why it should be "over": do you really want to wipe the wall (at least when the roll is full) with it in the "under position" then use it for personal hygiene? Jeff, I have a bad news for you. Toilet paper roll will wipe the wall first regardless of its position - "over" or "under". The only difference is the direction of wiping. Another reason to keep walls clean and neat even out of Facebook. Jeff, I am not worried about the walls. The TP is headed towards a much dirtier place. Which way the TP comes off the roll could be solved quickly by installing the dispensers found in commercial places. It is parallel to the wall, and usually a cat can't get to the end of the roll, because the paper dispenser always seem to hide the end of the paper up inside of the holder after the previous asswipe has used it. I always have to reach up inside to grab the end. Especially on the one's with the double roll holders, and the smoked plastic covers. I am amazed how the only comments on Bob's article seem to revolve (no pun intended) around toilet paper. Today's Geekly Update covered a lot of topics, but the only one that anybody really cares about is the toilet paper issue. And that's because there are still a few demented people in the world who prefer it "under", whereas every sane person knows it should be "over". I feel vaguely sorry for the "under" people, but the rest of society needs to protect itself from their depradations. I despise vertical videos! Why have a 1080P capable device and shoot vertical video? It makes no sense unless you are doing a close-up of your Christmas tree flashing. Einstien's equation, Tp=O(Over)squared divided by c is good enough for me. have taken over the world. I loved the way it folded and fit nicely in my pocket without everyone thinking I was really pleased to see them. Alas, the TP dilemma is another case of STYLE vs SUBSTANCE. I wish the end easy to find as I am visually impaired. Others obviously prefer the more stylish look with the end hidden. Both methods have an advantage, but in the middle of the night in a dark room I find the easy to grab method more advantageous for me. And I can't believe I took the time to type this. Does everyone know that a long time ago a council of bishops determined how many angels can dance on the head of a pin? The bog roll goes on the way it goes on. We don't have a cat so that rule doesn't apply. More concerning is ability to "mask" news of Facebook. Certainly fake news is an issue but I can see the facility being used to push down unpopular items rather than just fake ones.